Sequential injection chromatography (SIC) is a new alternative separation technology. It has some advantages over high performance liquid chromatography (HPLC) regarding simplicity, inexpensiveness, portability, ease of use, maintenance requirement and operation time. In contrast, SIC has had suffered from some limitations. The current work involves four achievements. (a) One of the limitations of SIC has been overcome. A higher pressure resistant selection valve with additional ports was installed in an SIC system. This development allows propelling solution without showing solution leakage. (b) A new inexpensive rapid and green method for the separation and quantification of propranolol (PRP) and hydrochlorothiazide (HTZ) in their formulations was optimized and validated. (c) A miniaturized multi-channel fiber optic detector was coupled with the newly developed SIC system to detect PRP and HTZ at 270 and 290 nm, respectively. This issue enhanced the sensitivity rather than using a single-channel detector. (d) A comparative study on the efficiency of the SIC method with that of previous HPLC methods was conducted. Besides the benefits of the instrumentation of SIC, the proposed method is rapider and more reagent-saving than previous HPLC methods. The total volume of consumed reagents and sample was 4.04 mL. The sample frequency was 22 samples/h. Other such analytical characters of the SIC method as resolution, peak symmetry, numbers of theoretical plates, linearity range, accuracy, precision and limits of detection and quantification recorded comparable results. Despite its limitations, conventional high performance liquid chromatography (HPLC) is still the dominant technique in pharmaceutical analysis. Conventional HPLC instrumentation has suffered from such challenges as long analysis time, large consumption of solvents and reagents, high cost, complicated routine maintenance, ease of use and large dimension. Flow injection (FI) techniques have been well-developed with the advantages of automation, miniaturization, versatility, simplicity and inexpensiveness. The family of FI techniques includes three generations and some versions [1, 2]. Sequential injection analysis (SIA), as the second generation, is the most effective technique [3–13]. SIA applies a miniaturized, fully-automated, bi-directional, discontinuous, precisely-choreographed and flow procedure. Nevertheless, implementing separation procedures with multi-analyte quantification in FI techniques was a challenge. The advent of monolithic columns has facilitated the combination of chromatography with FI techniques, particularly SIA. The joint use of SIA and monolithic columns has provided sequential injection chromatography (SIC) . The bimodal pore structure of monolithic columns, i.e. macro- and mesopores, allows higher performance separation at higher flow rates than those applied in particle columns. The instrumentation of SIC has some advantages over that of HPLC. The remarkable benefits of SIC are simplicity, inexpensiveness, portability, ease of use and less cost of routine maintenance. In addition, unlike HPLC, SIC applies a miniaturized discontinuous flow-based procedure. Hence, SIC is more reagent-saving than HPLC. This feature does not only render SIC methods inexpensive, but also provides better safety for the environment. In contrast, SIC has suffered from some drawbacks. The selection valve (SV) in commercially available SIC systems has a limited pressure tolerance, which is 250 psi. This drawback causes the problem of solution leakage especially when applying high flow rates, adopting a mobile phase including a buffer or installing long monolithic columns. Another drawback of SIC is that the syringe pump (SP) has limited flow rates, which is due to the maximum back pressure, which is about 2.5-3.0 MPa. Additionally, the SP has so far a limited volume; the commercially available maximum volume is 4 mL. Furthermore, sufficient software has not been developed yet for data interpretation. Despite all theses drawbacks, SIC has been successfully applied to pharmaceutical analysis [15, 16]. Propranolol hydrochloride (PRP) is a beta-blocker drug that is widely used in the treatment of angina pectoris, cardiac arrhythmias and hypertension . PRP is chemically named 2- propranolol,1-[(1-methylethyl)amino]-3-(1-naphthalenyoxy)-,hydrochloride, (±)- or (±)-1-(Isopropyl amino)-3-(1-napthyloxy)-2-propranol hydrochloride (Figure 1a). On the other hand, hydrochlorothiazide (HTZ) is a widely used thiazide diuretic agent. It is used for the treatment of both diuretic and hypertensive clinical indications . HTZ is chemically named 6-chloro-3, 4-dihydro-7-sulfamoyl-2H-1, 2, 4-bezothiadiazine 1,1-dioxide, 6-chloro-3, 4-dihydro-2H-1, 2, 4-benzothiadiazine-7-sulfonamide 1,1-dioxide,6-chloro-7-sulfamyl-3, 4-dihydro-1, 2, 4 - benzothiadiazine 1,1-dioxide,2H-1, 2, 4-benzothiadiazine-7-sulfonamide, 6-chloro-3, 4-dihydro-1, 1-dioxide (Figure 1b). The use of diuretics such as HTZ with beta blockers such as PRP has been advocated as the first line therapy for the treatment of hypertension in many countries. PRP and HTZ have been used in combination to provide an enhanced therapeutic effect than when either a drug is used alone . Chemical structure of (a) PRP and (b) HTZ. Using the Scopus® and Science Citation Index® databases, it has been found that few methods for the separation and simultaneous quantification of PRP and HTZ are available in the literature. In this issue, HPLC [20–22], thin layer chromatographic  and spectrophotometric methods [21, 24] were reported. The main objectives of the current work are: (a) to replace a lower pressure SV with less ports installed in commercially available SIC systems by a higher pressure SV with additional ports, (b) to develop a new competitor SIC method to previous HPLC methods for the separation and quantification of PRP and HTZ in their formulations, (c) to improve the sensitivity of the proposed method by coupling a miniaturized multi-channel detector with the newly developed SIC system and (d) to illustrate the advantages of SIC over HPLC throughout a comparative study. In the current work, a higher pressure resistant SV, which is used in HPLC systems, was installed in an SIC assembly. The pressure tolerance of the new SV was 5000 psi while that of the past SV was 250 psi. This development permitted efficient solution flow without showing solution leakage. The new SV has another advantage that includes 10 ports, which allow connecting more solutions. As shown in Figure 2, three standard solutions and five samples were attached simultaneously and analyzed in a one-shot run. Schematic diagram of a sequential injection chromatograph constructed for the separation and quantification of PRP and HTZ. Primarily, spectrum scans were carried for PRP and HTZ. It has been found that the λmax for PRP and HTZ were 270 and 290 nm, respectively. On the other hand, no need for internal standard since a simple procedure for sample treatment was applied. Additionally, peak height was adopted instead of peak area because sharp peaks were obtained. For developing separation, a C18 (4.6 × 50 mm) monolithic column has found to be suitable. For optimizing flow rate, the range of 10-40 μL/s has found to be practicable in SIC procedures based on column length and mobile phase composition . With respect to peak height and peak shape, the practicable range of sample volume has found to be 10-40 μL . At high flow rate, rapid elution and high peaks with insufficient separation were obtained. Peaks were also heightened by injecting large sample volumes. However, symmetrical peaks were not obtained. Therefore, to compromise between peak height, peak shape and analysis time, 40 μL/s flow rate and 30 μL sample volume were set as the optimum. For mobile phase composition, two systems were examined including 50 mmol/L phosphate:acetonitrile (85: 15, v/v) at pH 3.0  and 75 mmol/L phosphate:acetonitrile (70:30, v/v) at pH 3.0 . In the current study, the second mobile phase composition performed sufficient separation with acceptable peaks. The proposed SIC method was validated under the optimized conditions according to the guidelines of the main regulatory agencies, namely International Conference on Harmonization (ICH) of Technical Requirements for Registration of Pharmaceuticals for Human Use  and the International Union of Pure and Applied Chemistry (IUPAC) . Furthermore, a comparative study on analytical features of the SIC method with those of previous HPLC methods [20, 22] was conducted. All available experimental conditions and analytical features of the SIC and HPLC methods are introduced in Table 1. Under the optimized conditions, resolution (R), numbers of theoretical plates (N) and peak symmetry (PS) were calculated using equations 1-3, respectively. " tR " is a retention time. " wb " is the peak width at the base. " Af " is the area of a front peak. " At " is the area of a back peak. " w0.5 " is the peak width at a half height. PRP and HTZ were sufficiently separated (with a resolution of 3.6 and the number of theoretical plates of > 4200) in a short time. In a previous HPLC method , higher resolution, i.e. namely 8.9, was due to the use of a longer separation column (4.6 × 150 mm). 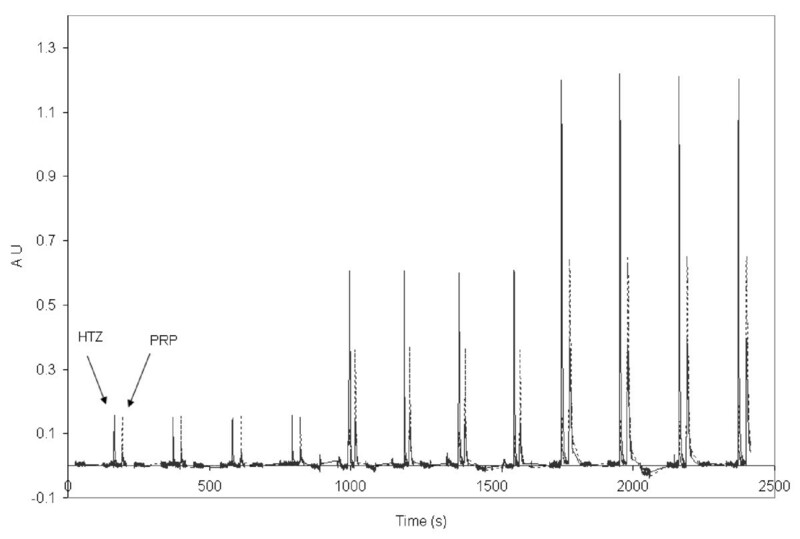 In another HPLC method , much higher resolution, i.e. namely 12.1, could be attributed to stationary and/or mobile phases that were/was applied. Despite a shorter C18 monolithic column was adopted in the current SIC method, satisfactory separation, with a resolution of 3.6, was achieved. In addition, comparable peak symmetry and numbers of theoretical plates were achieved in the SIC and HPLC methods. It is interesting to note that despite a slower flow rate in the SIC method than that in the previous HPLC methods was applied, a shorter retention time was obtained in the frontal method. This benefit could be attributed to the use of a short monolithic column. Several standard solutions of PRP and HTZ were subjected to SIC analysis. Figure 3 shows a typical chromatogram of four replicates of three standard solutions including PRP and HTZ. 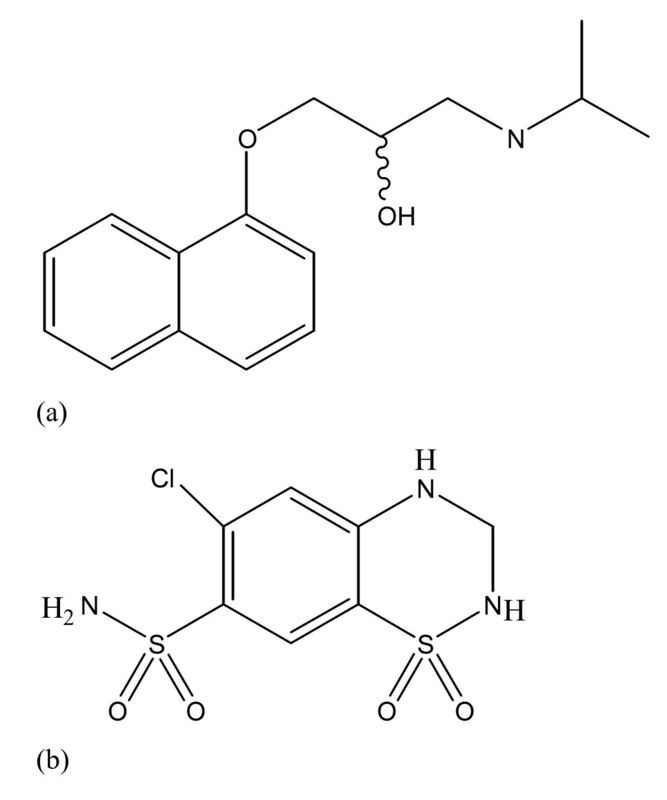 Satisfactory linearity of both drugs was obtained in the SIC method, which is comparable with that of the previous HPLC methods (Table 1) [20, 22]. Sequential injection chromatogram for four replicate measurements of 5, 25 and 50 μg/mL HTZ and 25, 100 and 200 μg/mL PRP for calibration purpose. Optimum conditions: C18 monolithic column (4.6 × 50 mm), a mobile phase composition of 75 mmol/L phosphate:acetonitrile (70:30, v/v) at pH 3.0, flow rate 30 μL/s, sample volume 40 μL, UV detection at 270 nm for HTZ and 290 nm for PRP. The intra-day precision was evaluated by analyzing three solutions obtained from tablets. Three concentrations of PRP and HTZ were applied. Each sample was sequentially analyzed seven times a day. Similarly, the inter-day precision was evaluated by analyzing the same samples in five consecutive days. The RSD of retention times and peak heights of PRP and HTZ were calculated. In general, as shown in Table 1, acceptable intra-day precision with RSD values of less than 1.0 was obtained from the SIC method and a previous HPLC method . The limit of detection (LOD) was examined as the concentration of a solute resulting in a peak height three times the baseline noise level. The limit of quantification (LOQ) was examined as the concentration of a solute resulting in a peak height ten times the baseline noise level. Table 1 shows that the SIC method has acceptable LOD and LOQ for both drugs in their formulations, which are comparable with those of a previous HPLC method . It is worth noting that the sensitivity of the SIC method was enhanced by using a short column, a large sample volume, a high flow rate and a multi-channel detector. For example, as shown in Figure 3, the standard solution including 25 μg/mL HTZ recorded 0.15 AU at 290 nm and 0.38 AU at 270 nm. Besides the benefits of the instrumentation of SIC discussed before, the proposed SIC method has further advantages over the previous HPLC methods [20, 22]. SIC applies a miniaturized discontinuous flow-based procedure. Therefore, the proposed SIC method is more reagent- and time-saving. The total volume of the consumed mobile phase including column conditioning in the SIC method was 4.0 mL. The total analysis time in the SIC method was 165 s (Table 1) while that in a previous HPLC method  was more than 1200 s. Hence, the sample frequency of the SIC method was 21 samples/h. The proposed SIC method was applied to tablet formulation with different doses of PRP and HTZ in combination and single forms (Figure 4). Each sample was applied in triplicate. To examine the reliability of the SIC method, the same samples were subjected in parallel to HPLC analysis using a previous procedure . The average of triplicate measurements was calculated. The results obtained are introduced in Table 2. The recovery was in the range of 100.5 - 95.7%, which indicates acceptable reliability of the SIC method. 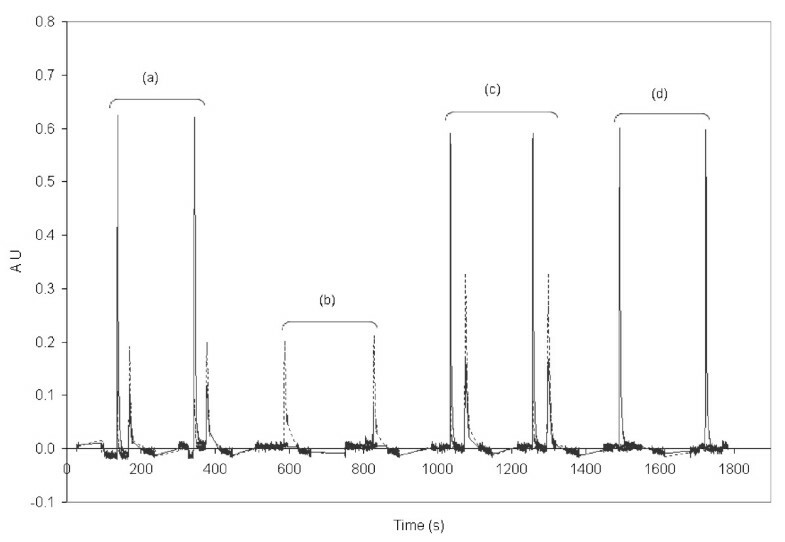 Sequential injection chromatogram for duplicate measurements of: (a) 25 μg/mL HTZ and 40 μg/mL PRP extracted from Inderide ® tablets; (b) 40 μg/mL PRP extracted from Ciplar LA ® tablets, (c) 25 μg/mL HTZ and 80 μg/mL PRP extracted from Inderide ® tablets and (d) 25 μg/mL HTZ extracted from Lannett ® tablets. Optimum conditions: C18 monolithic column (4.6 × 50 mm), a mobile phase composition of 75 mmol/L phosphate:acetonitrile (70:30, v/v) at pH 3.0, flow rate 30 μL/s, sample volume 40 μL, UV detection at 270 nm for HTZ and 290 nm for PRP. The following devices were used to construct an SIC assembly (Figure 2). S17 PDP® Syringe pump (SP) with a reservoir of 4 mL was manufactured by Sapphire Engineering (Pocasset, MA, USA). 10T-0179H Cheminert® high-pressure stainless-steel selection valve (up to 5000 psi) with 10 ports was manufactured by Valco Instrument Co. (Houston, TX, USA). USB-4000® fiber optic CCD UV/Vis detector and DH-2000® deuterium UV light source were manufactured by Ocean Optics Inc. (Dunedin, FL, USA). Ultem® 10 mm micro-volume Z-flow cell was supplied from FIAlab Instruments Inc. (Bellevue, WA, USA). 200 micron sub-miniature version A® fiber optic connectors with a core diameter of 600 μm were supplied from CeramOptec (East Longmeadow, MA, USA). Pump tubing of 0.03" I.D. Teflon type was supplied from Upchurch Scientific, Inc. (Oak Harbor, WA, USA). It was used to connect various devices in the SIC system and to make a holing coil (200 cm long). Chromolith® reversed-phase monolithic column (4.6 × 50 mm) and monolithic guard column (4.6 × 5 mm) were manufactured by Merck (Darmstadt, Germany). PC equipped with FIALab Software® for Windows® version 5.9 was supplied from FIAlab (Medina, WA, USA). It was used for programming and controlling the SIC system. All chemicals and reagents used in the current study were of analytical grade quality. Distilled deionized water was used throughout. Methanol, acetonitrile, disodium hydrogen phosphate, PRP and HTZ were supplied from Sigma-Aldrich (Taufkirchen, Germany). Mixed standard solution of PRP and HTZ (1000 μg/mL) was prepared by dissolving appropriate amounts directly in water. Working standard solutions were prepared by dilutions in appropriate ways. For sample preparation, twenty tablets of each sample were accurately weighed and powdered. Water was added to appropriate amounts of powder to extract PRP and HTZ. The obtained solutions were filtered through Whatmann® filter papers number one. Thereafter, the dilution was conducted in an appropriate way to obtain different concentrations. In general, all solutions were filtered through 0.45 μm membrane before injecting to an SIC system. As shown in Figure 2, mobile phase was linked with the check valve that is positioned at the front of the SP head. Waste was disposed through port-1. Guard column, separation column and Z were linked with port 2. Standard solutions were linked with port-3 to 5. Sample solutions were linked with port-6 to 10. A holding coil was installed between the central valve in SV and a port in the SP head. The relief valve was linked with a port at the bottom of the SP head. A rapid protocol controlling the proposed SIC procedure was programmed as illustrated in Table 3. In the current study, an SIC assembly was developed. A SV, with a higher pressure tolerance and additional ports, was installed in an SIC assembly. The new SV solved the problem of solution leakage especially when applying a high flow rate for propelling a mobile phase that includes a buffer. The additional ports permitted the analysis of eight samples with a one-shot. On the other hand, a new SIC method for the separation and simultaneous quantification of PRP and HTZ in their formulations was developed. A comparative study on the efficiency of the proposed SIC method with previous HPLC methods was conducted. The SIC method recorded some advantages over the HPLC methods with respect to rapidity, reagent consumption and safety for the environment, besides the benefits of the instrumentation of SIC over HPLC in terms of cost, portability, operation procedure, stabilization time and maintenance process. Dr. Abubakr M. Idris is a Sudanese assistant professor of analytical chemistry. He is currently at the Department of Chemistry, College of Science, King Faisal University, Hofuf, Saudi Arabia. He received his BSc (1994), MSc (1999) and PhD (2005) from the University of Khartoum, Khartoum, Sudan. Idris has authored about forty-five papers published in international refereed journals and conferences. His research focuses on developing microfluidic analytical technologies and their methodologies. He has some publications on environmental analysis issues as well. The authors express their gratitude to the financial support from King Abdulaziz City for Science and Technology, Saudi Arabia, award # MT-3-6. The authors also thank Dr. Ilkka and the colleagues at FIAlab® Instruments Inc. (Bellevue, WA, USA) for their continuous support for developing an SIC assembly. Thanks also are due to the Department of Chemistry, College of Science, King Faisal University for allowing the authors to conduct this work. AMI proposed the design of the study, carried out the development of the SIC system, designed the optimization process and drafted the manuscript. REEE carried out all experimental works and performed the statistical analysis. AMI and REEE read and approved the final manuscript.